Being an enthusiastic gardener, I welcome spring with open arms and can’t wait to get out into the garden to watch it come to life. And it’s not just the plants I’m watching, it’s the animals, birds, lizards and insects that are reappearing after their winter absence. They arrive slowly at first but as the days get warmer, they increase in numbers until I have my very own noisy, bustling, thriving little Garden of Eden. And then the crash! It went previously un-noticed but is now widely apparent… the APHIDS have arrived! 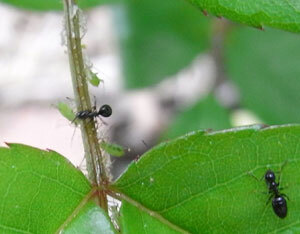 Aphids cause such distress to home gardeners, particularly to rose and vegetable growers. They lovingly watch their plants come into leaf and bud each spring when suddenly there’s the tell tale signs of aphid activity. 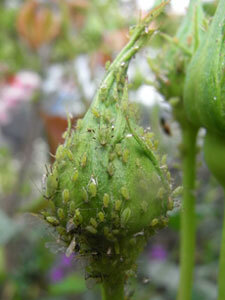 Aphid numbers start small and look manageable, initially appearing to be only one or two little green nymphs. But rapidly population numbers increase until all of a sudden the plants’ buds and many young leaves, are covered in a mass of gyrating, green bodies in a frenzy of sap sucking as if their very lives depended on it. And littered around them are untidy white flecks and bizarre hollow creamy balls. 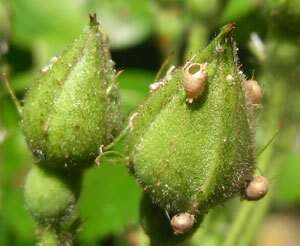 And when you touch the buds they have an unpleasant stickiness that is repellent. It’s an INFESTATION and can be incredibly distressing. 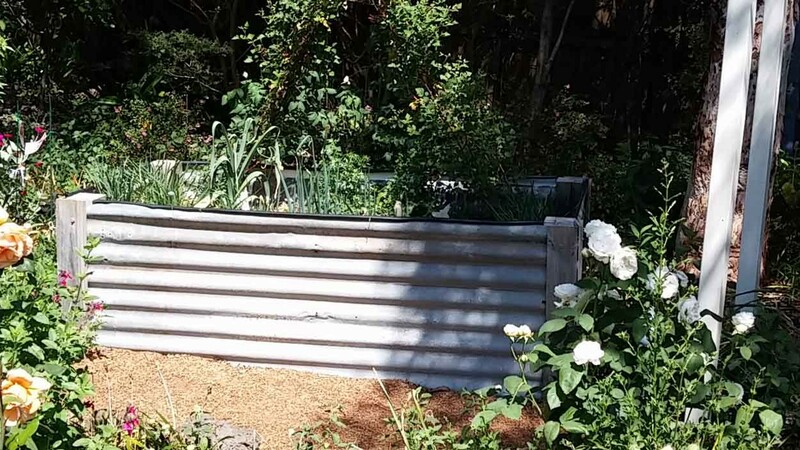 Here’s where I out myself… over many years of gardening I’ve become a bit of a bug-ophile! It’s not something I admit to often, and my family is concerned that I’m turning into ‘one of those people‘, but insects have become a secret fascination of mine. Not in an unpleasant ‘stick-pins-into-them-and-mount-them’ way, but more in a ‘stand-in-the-garden-and-observe-them’ way. So over the years I’ve furtively managed to observe and get some real insights into the machinations of an aphid colony. Firstly, green peach aphids (Myzus persicae) are incredibly efficient breeders. For most of the year the colony is predominantly female. These female aphids only give birth to aphid daughters and there’s nary a male aphid in sight! (This is called parthenogenesis or asexual reproduction and is where most people’s eyes start to glaze over and they shuffle off… silently!) 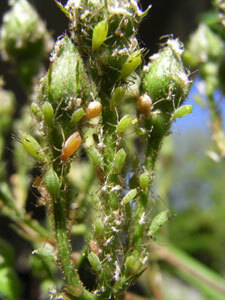 The young female aphids are exact clones of their mothers and can start to reproduce within 5 days of birth. 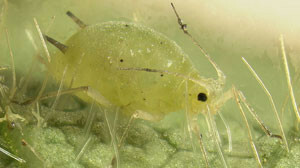 Effectively each aphid colony consists of a cloned population of daughters, mothers and grandmothers all reproducing and all drawing sap from the host plant. And that’s about all they do – breed and feed! And as they grow from little nymphs to, eventually, grandmothers they moult or shed their skins, hence the white flecks seen dotted around the aphid colony. Hopeless cleaners, these girls! But not everything goes their way. 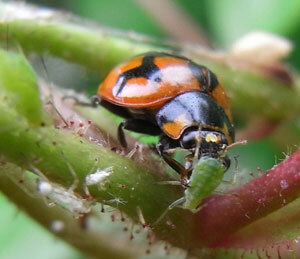 There are plenty of garden predators stomping about (relatively speaking) just waiting to feed on succulent aphid flesh. (This is where the remainder of my audience leaves the building!) Ants are incredibly sophisticated and will ‘herd’, ‘farm’ and even ‘milk’ aphids in order to obtain the honeydew they secrete. This honeydew is the stickiness you feel on your plant when aphids abound. It’s just amazing! But wait… there’s more! A final note about aphid colonies is that they are generally short lived. They reproduce so well and so fast that the colony soon becomes too big and the available space available for ‘sap sucking’ becomes limited. The resultant food shortages trigger the birth of winged aphids that fly off to establish new colonies on uninhabited and juicier plants nearby! So next time you begin to despair when you see aphids on your precious roses… STOP, take a deep breath and have a look at what’s going on. You’ll be fascinated! 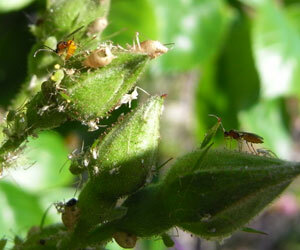 For information on how to control aphids check out the Aphids info page.